President Donald Trump, one month into the federal government shutdown, took to Twitter to thank federal employees who are working without pay. The nation's 800,000 federal workers will miss their second paycheck this week. About half of them, however, are considered "essential" and are working anyway. "To all of the great people who are working so hard for your Country and not getting paid I say, THANK YOU - YOU ARE GREAT PATRIOTS!" Trump tweeted late Sunday. "We must now work together, after decades of abuse, to finally fix the Humanitarian, Criminal & Drug Crisis at our Border. WE WILL WIN BIG!" Not everyone scheduled to work is showing up, however. The Transportation Security Administration said Sunday that its rate of unscheduled absences was creeping higher. About 8 percent of employees took unscheduled absences on Saturday, up from a 3 percent on the same date a year ago. TSA reiterated in a statement Sunday that "many employees are reporting that they are not able to report to work due to financial limitations." TSA did not provide details, but some federal workers have been taking temporary jobs to provide income during the shutdown. Trump has insisted he will not sign an appropriations bill that doesn't include $5.7 billion for the wall, and Democrats say they won't negotiate until the government is reopened. 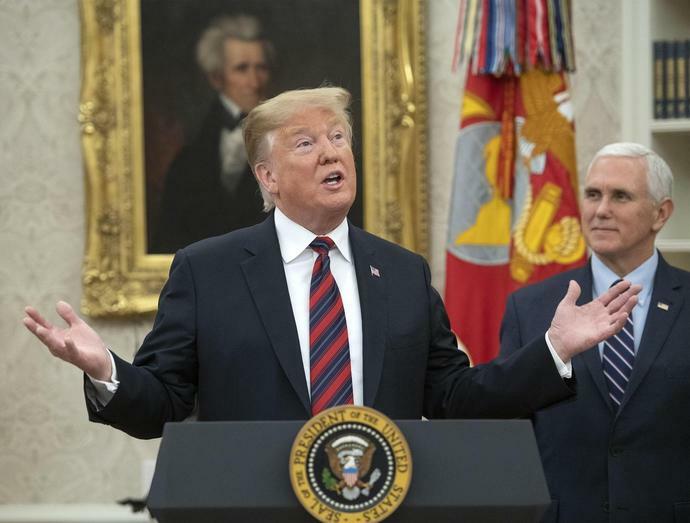 Trump criticized congressional Democrats on Sunday for rejecting his latest plan to fund the border wall and end the partial government shutdown. He offered to grant three years of protection from deportation for undocumented people brought into the U.S. as children - often referred to as DREAMers - and for people granted Temporary Protected Status because of a crisis in their home countries. Historically, federal employees who drew no pay during government shutdowns have been paid whether they worked or not. This shutdown, however, has been the longest shutdown in U.S. history. Meanwhile, some federal employees work, some don't, and for now none are getting paid. "Reopen the government, let workers get their paychecks and then we can discuss how we can come together to protect the border," House Speaker Nancy Pelosi tweeted Sunday.